Established in 1992, based at Manston Kent International Airport next to Summit Aviation and now at our Honda Shop site at Barham Canterbury, our training sites are large enough for us to replicate the Module One test manoeuvres. Our Driving Standards Agency (DSA) qualified instructors are always on hand to give you friendly expert advice about your training. 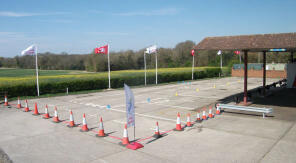 We run structured courses to suit all needs and riding abilities. We are a Honda approved training school. We use all modern Honda training bikes and scooters. All our bikes are well maintained in our superb up to date workshop by factory trained technicians.
" Thank you so much to all the instructors who made the frightful experience of going from no skills to passing my Test such an enjoyable (and safe) experience! Well worth it and great tuition!" " Have loved the whole experience from CBT to MOD2. The organisation of the lessons and tests by David Long and the gentle, encouraging, funny and most importantly, effective teaching by Steve Clark"
" The guys here are so welcoming and friendly would 100% recommend to anyone who is looking to start riding"
"What can I say other than thank you so much for all the training and support. " 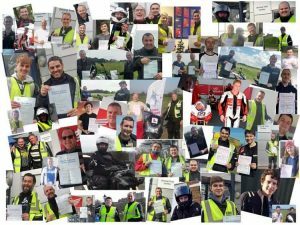 "Passed my mod 2 today couldn't have done it without all the support and help from a very professional fantastic group of guys , thankyou x"
"The best training around. Great bunch of guys with a world of experience between them. For the price its unbeatable"
"Great training. Great instructors. Enjoyed every minute of it. Special thanks to Horizontal Steve." Always on hand to give you friendly expert advice about your training.